The MTA is moving into the next phase of construction on the elevator installation project at the Greenpoint Avenue G station, but there’s good news for roughly 9,400 regular weekday customers: the MTA is expecting “significantly reduced impact” to service. Work will also focus on updating station infrastructure including stairs, handrails, turnstiles, powered gates, and braille signage—bringing the station to full ADA compliance. 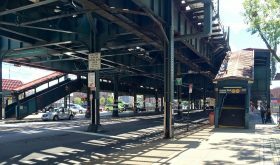 The Astoria Blvd N and W station in Queens will close at 10 p.m. on Sunday, March 17 and remain shuttered for nine months as New York City Transit works on a multi-phase repair project. The elevated station will get four new elevators and other accessibility features. In order to construct the street elevators, the mezzanine level will be demolished and rebuilt with more vertical clearance to prevent strikes by trucks and other over-height vehicles on the road below. 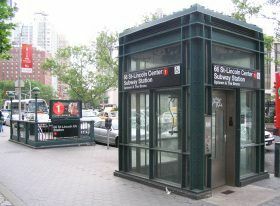 The Metropolitan Transportation Authority currently claims that 114 of its 427 stations—or 24 percent—are accessible. But a new study led by Manhattan Borough President Gale Brewer’s office shows otherwise. 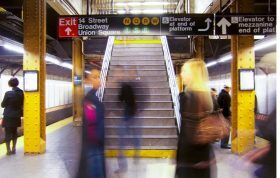 A team of staffers surveyed 42 of the stations that the MTA deems accessible, visiting each station on four separate days at different times of the day. Based on complaints and conversations with advocates, they assessed elevator accessibility, station signage, and features for vision-impaired riders. As Curbed first reported, their findings show that an already sub-par statistic is actually inflated. 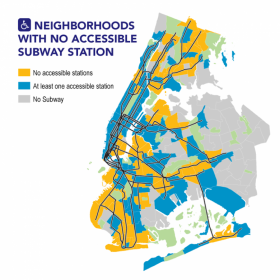 More than half of the 122 neighborhoods served by New York City’s subway system do not have a single accessible station, a new report by City Comptroller Scott Stringer found. And out of the 62 neighborhoods dubbed “ADA transit deserts,” 55 are in the Bronx, Brooklyn and Queens. In his report, “Service Denied,” Stringer details the gaps in accessibility for seniors and mobility-impaired New Yorkers and calls on the state legislature to create a new funding source dedicated to upgrades compliant with the American with Disabilities Act. The MTA has found itself on the wrong end of a lawsuit by the feds for failing to make its subway stations wheelchair-accessible. 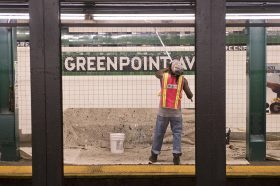 On Tuesday, U.S. Attorney Geoffrey Berman joined a lawsuit accusing the agency of not adding assistance for disabled riders when renovating stations, the New York Post reports. The suit began in 2016 when a civic agency in the Bronx accused the MTA of violating the Americans with Disabilities Act by not creating wheelchair access at the Middletown Road station. The suit should come as no surprise; as 6sqft previously reported, fewer than 1/4 of New York City’s subway stations are fully wheelchair-accessible–only 117 out of 472. 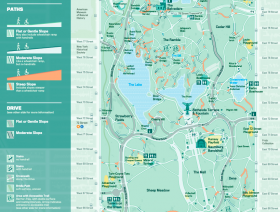 In fact, NYC ranks the least accessible out of the country’s ten largest metro systems–all of LA’s 93 stations and DC’s 91, for example, are fully accessible. 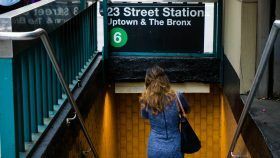 Out of NYC’s 472 subway stations, only 117 are fully accessible, a major problem considering more than 800,000 or one-in-ten New Yorkers have a physical disability (and this doesn’t take into account those who get injured or are with a stroller). The reason for this is that our subway system was built starting in 1904, long before the Americans with Disabilities Act (ADA) became law in 1990. 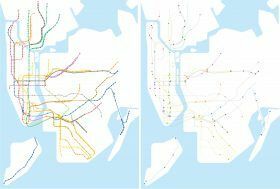 To highlight the issue, the Guardian put together these startling maps that show worldwide metro systems in their entirety as compared to versions that only include fully accessible stations. If you’ve ever endured the long ride to any of the area’s airports, all the while lugging your suitcase and anxiously wondering if you’d miss your flight, then this statistic probably comes as no surprise. 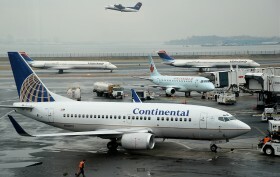 According to a study by the Global Gateway Alliance, “John F. Kennedy and LaGuardia airports rank last and third-to-last, respectively, in mass-transit accessibility compared with 30 of the world’s busiest airports,” reports Crain’s. The analysis looked at total travel time for public transit users, mode of transportation and number of transfers and cost, scoring them from 0 to 100. And if Anthony Weiner is correct, the new LaGuardia AirTrain will only increase travel times–not good news those for us who prefer not to sit in insane taxi traffic or fork over $99 for a private helicopter ride.